There's an asterisk on this, because I limit this to 4,098 unique tweets returned by a search for ct_turf from September 22 to October 4. From those, I selected the 25 with the highest favorite count. Note that the favorite count was at the time of the search, which was multiple times from Sep 29 to Oct 4. Thus, the favorites on the tweets may be quite different now from the time of the search. As an example, Jeff Johnson's "tweet of the year" about amazing surfaces didn't make my top 25 because that tweet was saved just a couple hours after it had been posted, when it hadn't yet reached the 103 favorites that I see at the time of this writing. 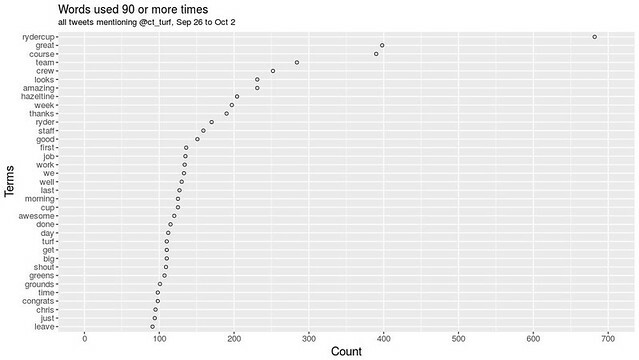 From the 4,098 tweets returned by a search for ct_turf, I wanted to find those that had the most favorites. That's an easy assessment of which tweets were the most popular. First, I checked the favorite count on all the tweets. I had a set of tweets from the evening of September 22 until midday on October 4. Then I found the top 25 in terms of how many favorites they had at the time the search was made. I was recently at Hazeltine National Golf Club for the Ryder Cup. When I arrived, I was informed that it had been extraordinarily rainy since early to mid-August. I had a chance to observe the rain myself as well. 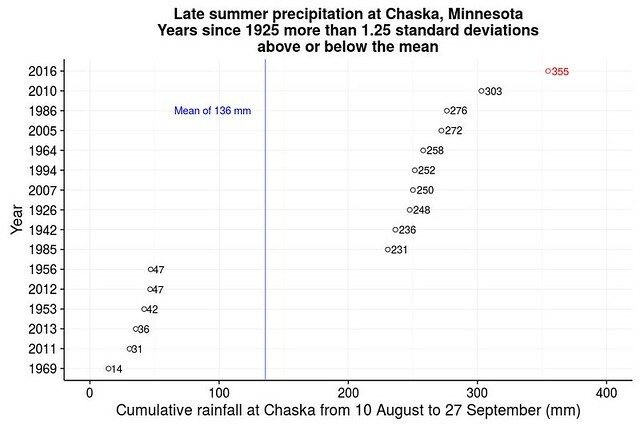 I wondered just how extraordinary the rain was, so I looked it up. You can see all the charts I made in this Flickr album. Another thing I looked at was when, who, and about what were people communicating with Chris Tritabaugh, the golf course superintendent at Hazeltine National Golf Club. 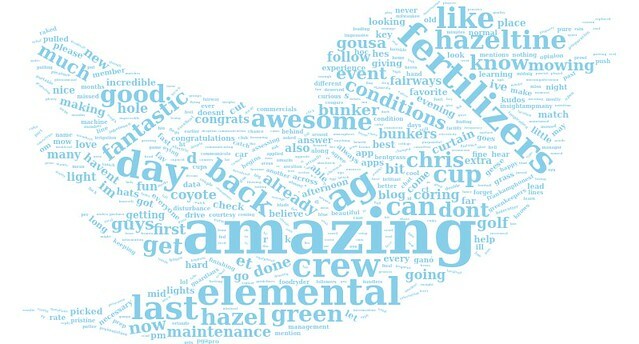 These are the words used most often during the week in tweets mentioning Chris's Twitter account. 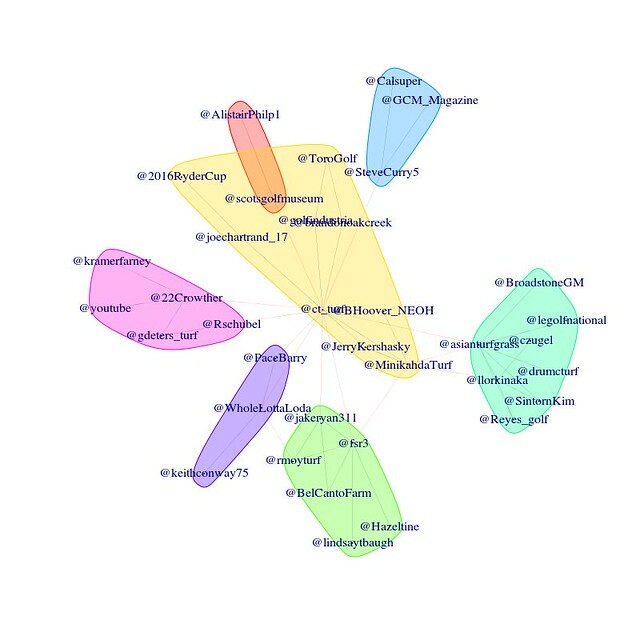 This shows the discussion about the @ct_turf account on Twitter for the week. There are a number of hubs in the discussion. Zooming in to just one hour on Saturday morning, one can see accounts grouped into conversations based on who was communicating at that time. I even made a word cloud, these for the conversation on Saturday, 1 October. All 33 charts are in this album if you would like to see more. Ryo Ishikawa won the KBC Augusta tournament at Keya GC in Fukuoka this week. Before the tournament started, he was so struck by the green conditions that he wrote about it on his website. During the tournament, he putted well, with 27 putts Thursday, 26 Friday, 24 Saturday, and 26 Sunday. He had no three putts and 41 one putts on these korai greens during the tournament. I wondered how the clipping volume at Keya GC during the tournament this year compared to other courses. I also wondered if the variation in clipping volume from green to green during the tournament was different from clipping volume variability during a regular week. To do that, I looked at clipping volume from 7 consecutive days in which greens were mown. Data from Keya during tournament week in 2016 are in the chart below, along with data from the last 7 mowing days at Keya during July 2016, and data from earlier this year from two different courses with cool-season grass. As far as consistency in the volume of clippings, the tournament data looks impressive. I would expect that this consistency in clipping volume would result in more consistent ball roll on the greens during a tournament compared to everyday play. I wanted to look also at the variability in clipping volume from green to green on a particular day. Is the variability in clipping volume from green to green lower during the tournament maintenance? To do that, I calculated the coefficient of variation (cv) for these same data. The cv is the standard deviation (σ) divided by the mean (μ). I like that the cv during the tournament week was on a downward trend. I don't see a huge difference in the overall cv -- the mean cv for these dates is 0.31 for C3 grass #1, 0.37 for C3 grass #2, 0.32 for Keya at KBC Augusta 2016, and 0.32 for Keya during the last 7 mows of July. One might speculate that greens with the same growing environment and the same soil and the same grass would have a lower cv. The cv shown here may represent some indication of the microclimate effect on growth across a property. Next week is the KBC Augusta (KBCオーガスタ) tournament at Keya Golf Club in Japan. This is a rare event -- a professional golf tournament played on korai (Zoysia matrella) greens. Zoysia on putting greens, why? How does a ball roll on zoysia? I may share a few photos and observations from the tournament. If I do, I'll use the #KBCオーガスタ hashtag. You can also find out more about this grass and its maintenance at the Keya Golf Club Turfgrass Maintenance page or by following Keya GC superintendent Andrew McDaniel. After I shared my answer to the question about PGA TOUR conditioning guidelines, I received some feedback by email and take this opportunity to share more information on this topic. The guy on your blog was asking for “a rule of PGA tour course setting,” but there are no rules and only the guidelines as you properly provided to him. They are subject to a degree of application by experienced agronomists — and the the agronomists of the professional tours are the most experienced experts in the world ... I get worried when average golf course greenskeeper / supts consider duplicating PGA Tour conditions as hard and fast ‘rules.’ A little bit of information can be dangerously injurious in the wrong hands. Hope you can point this out to this fellow so he can caution others too as they also glean good info from the Tour’s guidelines. They are exactly that, "Guidelines". Micah, each week on all six Tours now, we work with the advance team of Agronomist and Rules Official to pre determine set up for that specific course, based on the tournament expectations, course conditions, grass types, weather pattern, staffing level and talent, equipment availability, etc. Although our general efforts are focused on firm, dry playing conditions, this is relative to many factors. As example, we typically play tournaments with green speeds ranging from 10.5' to 13.5' depending on a lot of different factors. We have actually played on 8.5' when the wind is howling. "I need a rule of PGA Tour course setting"
I have a favor to ask of you. I need a rule of PGA tour course setting. Because I will presentation PGA tour course setting in my office. So I search for rule .. but i didn't find clear reference. I think the references in question are on this informative PGA Tour Agronomy page. Specifically, click the Tournament Prep tab, and then the PGA TOUR tab, and then download the Course Conditioning Guidelines document. A couple years old, but should be good enough for making a presentation in the office about PGA Tour conditions. The KBC Augusta golf tournament is held the last week of August at Keya Golf Club near Fukuoka. The greens are korai (Zoysia matrella) and when the greens are mown, the volume of clippings is noted. These data are collected not only during the tournament week, but throughout the year when the greens are mown. Andrew McDaniel, the greenkeeper at Keya GC, shared the clipping yield data with me and I've summarized it in these charts. The average daily clipping yield, plotted week by week through the year, shows that the grass starts growing at the end of March, reaches a peak in the hottest weather of July and August, before dropping down due to tournament preparations. This reduction in clipping volume is achieved by reducing the N rate, only adding irrigation to prevent dry spots, and applying trinexapac-ethyl. 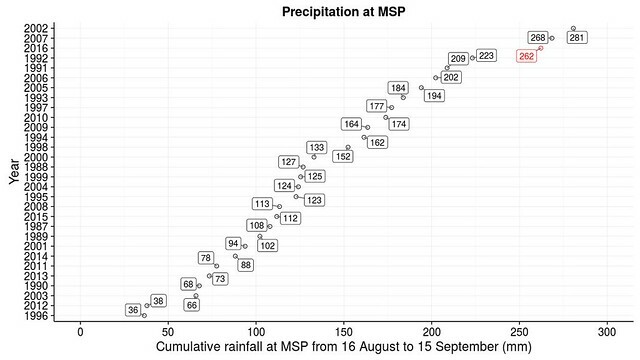 Looking just at August of 2015, one sees there were 4 days when the greens could not be cut due to heavy rain. One of those days was 25 August, the Tuesday of tournament week, when a typhoon came through. Not surprisingly, the clipping volume is larger on the day after a missed mowing. There was a downward trend through August, with the maintenance being done in a way that targets a clipping yield during tournament week of less than 1 liter per 100 m2 of green area. Looking at clipping volume every day in 2015, it is even more clear when the grass starts growing in the spring, and also that the korai doesn't really grow until after the rainy season, when the temperatures increase. It is only in July and August when the grass is growing quickly. This chart also shows the days during the season when the greens could not be mown. Looking at clipping volume for the 2013, 2014, and 2015 KBC August tournaments, one can see the 2014 and 2015 tournaments had less than 1 liter per 100 m2 from Thursday through Sunday. Based on measurements of green speed and evaluation of ball roll, the goal in 2016 will be to get the clipping yield down to the 1 liter level by the start of tournament week. These measurements don't take much time to collect and they can be useful in evaluating how the maintenance work should be adjusted to achieve the desired green conditions. What about the work that was done to get this clipping volume, and the conditions produced? On the greens at Keya GC, 8.5 g N and 3.5 g K/m2 since the start of 2015. Mowing height for the tournament was 2.6 mm with the Shibaura 22 inch GEXE. Except when adjusted due to weather, the greens were mown 2x each morning, then rolled with a Toro lightweight roller, and then were mown 1x at the end of the day. Primo Maxx and soil surfactants applied to the greens. Irrigation added as necessary to prevent dry spots. Morning green speed during the tournament rounds ranged from 10.7 to 11.2 feet. This animated chart shows the maximum sustained wind speed for each of the past 609 July days at RAF Leuchars. This image shows the mean daily wind speed at RAF Leuchars for each July day from 1 July 1996 through 19 July 2015. Wind speed on days at which the Open Championship was contested at the Old Course are red. Refresh the page to see the animation again. For histograms and boxplots of these same data, see yesterday's post. How windy was it in St. Andrews yesterday? It was exceptionally windy. I don't have data specifically for St. Andrews, but I was able to find data from RAF Leuchars, just across the Eden Estuary from the Old Course at St. Andrews. I downloaded (from Weather Underground, as described here), the daily wind speed data for every July day since 1 July 1996. That is, 607 July days from the start of July in 1996 through 18 July 2015. Twenty years of July days. In these 607 days, yesterday had the highest mean daily wind speed, 42 km/h, by a wide margin. In fact, the next closest day had average wind speed of 32 km/h. For the maximum sustained wind speed, which I think is the average across a 2 minute period, there were only three July days, out of the past 607, which exceeded the 55 km/h of yesterday. For the maximum wind gust, not every day has a record for that. For the days with a maximum wind gust record, there was only a single July day exceeding the 80 km/h gust of yesterday. These box plots below show all the data. The mean wind speed, maximum sustained wind speed, and maximum wind gust speed for 18 July 2015 are shown as red triangles. These data, from the most recent twenty years, show that the wind speeds of 18 July 2015 were extraordinary.